Arc received major changes in Patch 3.3, and immediately re-cemented itself as community favorite in all sorts of builds. The Arc Mines Saboteur is inarguably the most dominant of all Arc variants, providing great clear, fantastic boss killing capability, and powerful defenses. Perhaps even more exciting, this build can function on any level of budget and still perform at exceptionally strong levels, and is a great choice for Trade Leagues and Solo-Self Found alike. Saboteurs can deal with any map affixes with ease, and completely ignore some of the game’s most punishing mechanics. Our Arc Mines Saboteur is a premium build that remains a powerhouse despite recent nerfs. If you enjoy trappers/miners, or you want a welcome change of pace or style, there are few builds more capable than this one. This is a fast moving build that clears without interruption. As you dash through maps, lay your mines and Arc will do the rest, clearing everything on screen in a single press. Flame Dash can be used to clear troublesome obstacles, ledges, and fences that impede our movement. Here is our recommended skill tree for a Life-based version of the build. There are a variety of modifications you can make to this tree. Early on, you will prefer the trap and mine damage nodes in the Shadow starting area. This can be swapped for the Intelligence in the end game to save points that are better invested elsewhere. 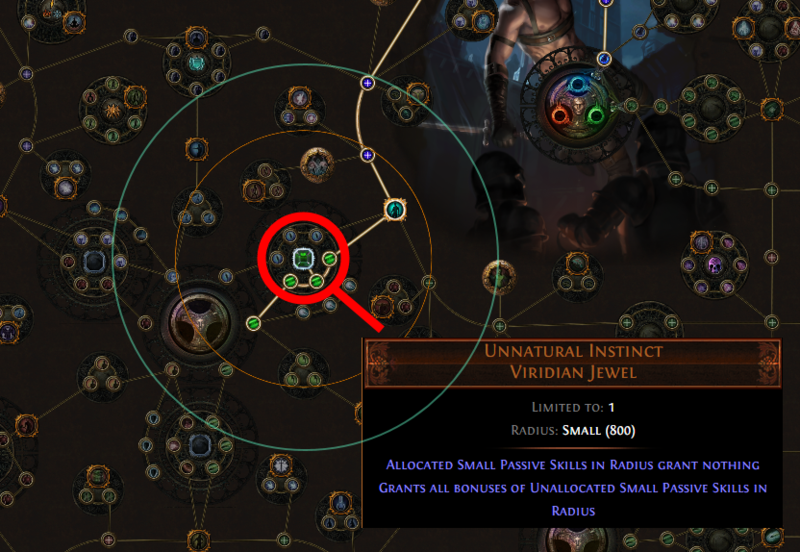 Dropping a lot of life nodes from the build is also possible, and even advantageous in some circumstances, such as Delving. There is a lot of personal preference involved in reaching a level of defense comfortable for you and your gear. For additional damage, drop Blood Drinker and the Written in Blood wheel, heading down to the Scion starting area through Harrier instead. Grab the Attack Speed nodes and the Jewel Socket in the Scion starting area. Feel free to drop Blood Siphon as well, if you feel comfortable playing on a low life pool. Here is a recommended skill tree for a Low-Life version of the build. Low-Life can provide higher damage and defense against large hits, but is not as good of a Delver and is more expensive to outfit early on. This is more of a personal choice rather and should not be seen as an “end point” for this build, as either avenue is powerful. In this build, Arc is our main skill and only real source of both clear and boss damage. Wrath is our aura of choice, used to add a huge amount of Lightning damage to our kit, and Clarity is also utilized to keep our Mana regeneration healthy. Phase Run is also extremely important to the mobility and survivability of your build, allowing you to zip around maps safely like a race car. Aside from these core links, almost all additional gems are optional, or left to the player’s choice. We always recommend running a Cast when Damage Taken Support + Immortal Call setup, to prevent any surprise Physical damage from eliminating you immediately. A Vaal skill should also be worked into a link; for Life based, we like to use Vaal Righteous Fire for additional damage on long-lived bosses, such as Uber Elder. If you are playing the Low-Life variant, Vaal Discipline will be the go-to choice, instead. There are two possible 6-links for Arc, depending on whether you are using Tremor Rod or a Rare wand. The gems are listed in order of priority. Lightning Penetration Support is the icing on the cake for punching through bosses. Added Cold Damage Support or Ice Bite Support are defensive options that freeze and shatter enemies, which can be very helpful against certain enemies (such as porcupines) and against detonate dead. While not a default recommendation, it can be helpful for deep delving. Choose one and swap out Trap and Mine Damage Support. This is only recommended for clearing, however, and is not useful on bosses. Swap in Item Rarity Support if you are using a Magic Find setup and want to up your Rarity bonus. This setup will be in your chest. Elemental Focus Support can be used instead of Minefield Support if you have +1 mines on your helmet. As mentioned in the Tremor Rod section, feel free to swap in a cold gem for difficult clears and added defense if you wish. There is no need for a second six link in our build, however, we can use the space for leveling gems, running Auras, and using Vaal skills. Our preference is to run the following 4-link in our chest, using the remaining two slots to level gems such as Empower Support or Enlighten Support. You can also slot in a Portal gem supported by Enhance Support. Summon Ice Golem can also be swapped out for Increased Duration Support, or you could opt to use that slot for any gem of your preference, such as Portal. Alternatively, you can put Flame Dash in the fourth slot in this link, however, you will lose Faster Casting Support. Although Phase Run is our primary form of mobility for general clearing, having a quick Flame Dash for tricky bosses like Uber Atziri and Uber Elder can be invaluable. Make use of the other two sockets however you prefer. This is a 3-Link, with Wrath in an unlinked socket. If you opt for a Cast when Damage Taken Support link you will have to combine links elsewhere, or sacrifice one of the other links. 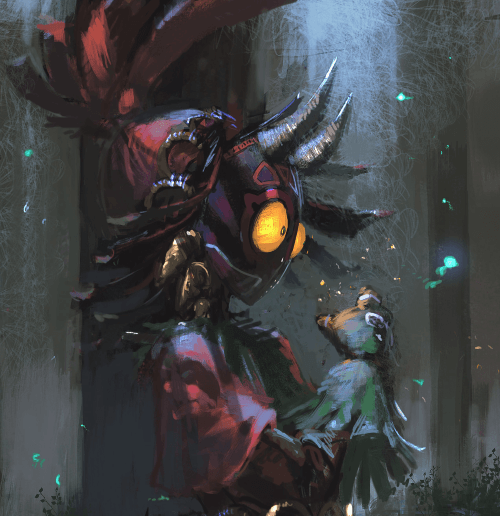 There is not really a correct answer for what links are best, as they all grant utility that depends highly on the player’s playstyle and what content they prefer to run the most often. 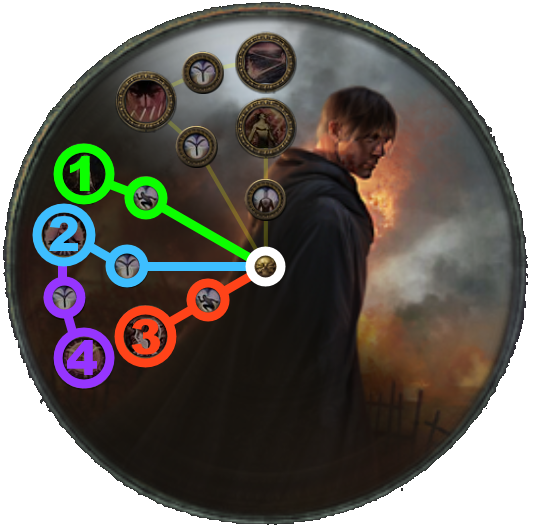 We like to run Temporal Chains (Level 5), however, there are other great options such as Enfeeble. The Ascendancy choices for this build are the same for either variant, as is the recommended order of ascension. All of the keystones are relatively valuable to the build, and it is absolutely acceptable to alter the order in which you acquire the Ascendancy nodes. Pyromaniac is a common first choice for all Saboteur builds, due to its incredible leveling benefits. The ailment immunity combined with the Life regeneration adds a potent amount of defense to your exile, and the reduced Mana cost offers higher quality of life than it may first appear. Your character will already have enough damage to clear without carpeting the area in mines, making Pyromaniac the logical choice to allow you to play and clear faster and more aggressively. Bomb Specialist is a great second pickup, upping your damage right around the point in the game where you can start making full use of it. This node is especially excellent for farming Blood Aqueducts while leveling, as the bonus is virtually always active, however, it is a formidable all around damage keystone. In the end-game, Bomb Specialist has a very high uptime, and is an incredible node for bosses in particular. Born in the Shadows is a fantastic keystone for both offense and defense, and is recommended as the third pickup. The all around benefits of this keystone feel great to unlock right as you are heading into maps, and tougher end-game content. Additionally, Uber Lab feels a lot safer with this keystone, and the permanent Blind is not to be undervalued. Demolitions Specialist is a nice quality of life keystone that further improves clear speed and damage output. Life-based: Kill all of the Bandits for the passive points. Alira and Passive Points are both very close for both builds, with Alira being a superior early game and leveling option for both variants. Pantheon choices, as with many builds, are fairly trivial for general use and largely come down to personal preferences. Soul of Solaris: Simply the best Pantheon for bossing, with all three upgrades being worthwhile. Soul of Lunaris: Great for general mapping and delving. The first two upgrades are good pickups to further reduce incoming damage. If you are using a golem, the third upgrade equates to a quality of life upgrade, and will reduce the number of times you need to resummon it. Soul of Arakaali: Useful when entering high level Incursions or the Vaal Temple. Soul of Garukhan: A great choice for general clearing, and should be upgraded as soon as possible. Soul of Shakari: A strong all around choice that is valuable in any situation. The upgraded version is icing on the cake, and nullifies certain affixes entirely. Soul of Ralakesh: This one can be useful in niche situations when upgraded, particularly when dealing with mobs or bosses with nasty bleeds, like Atziri. In this section, you will find our recommendations for all the pieces needed to outfit your exile in an optimal way. Please keep in mind substitutions and upgrades are certainly possible, and not to be discouraged or uncomfortable with using your own pieces. For the Life variant, Queen of the Forest is simply one of the best all around options available. Not only is it very affordable, it offers incredible Evasion, great movement speed, and Resistances. 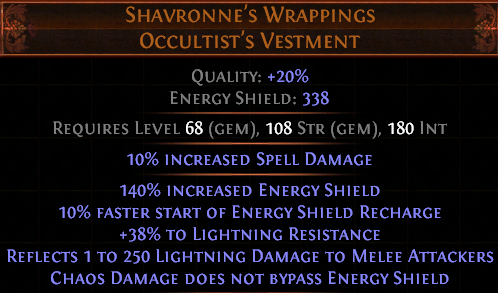 For the Low-Life variant, Shavronne's Wrappings is the only option and a build-making unique. Do not even bother playing this variant of the build without using this unique as there are simply no advantages over a standard build. 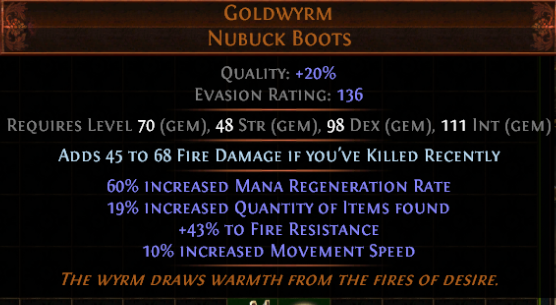 A Rare pair of boots with Life and Resistances is typically the best choice for Life-based builds. Ensure you have at least 25% or better movement speed. The recommended Enchant is Adds 1-160 Lightning Damage if you haven’t killed recently. As we already have more than enough damage to eliminate the entire screen and more with the press of a button, we are looking to bolster our boss damage. Damage Penetrates 10% of Elemental Resistances if you haven’t killed recently is another viable option that may or may not be cheaper. Sin Trek is an extremely cheap and formidable choice for Low-Life variants, providing great movement speed and a huge amount of Energy Shield. Goldwyrm is an option for Magic Find. Maligaro's Virtuosity is a cheap and effective option, providing a massive boost to both critical strike chance and multiplier. This can easily be picked up first day of the league and last you until the very end of it as well. Fenumus' Weave is the ideal choice for Low-Life variants of the build, granting great offense and defense via the potent Aspect of the Spider skill it provides. These can be very expensive and are more of a luxury item than a necessity. A Rare pair of Fingerless Silk Gloves is by far the best option for Low-Life variants if you cannot acquire the above gloves, as they have a great implicit that beats any enchant out of the water. Look for high Energy shield (180+) and Resistances. 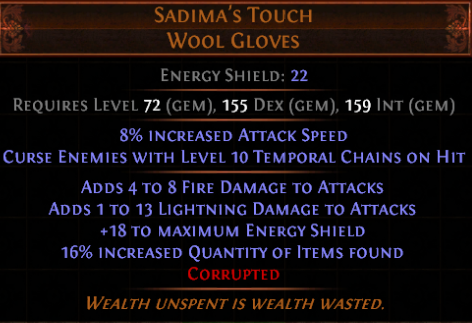 Sadima's Touch is the best option for Magic Find. Curtain Call can be very cheaply obtained and is an excellent pickup for Life-based builds. Hitting 500 Dexterity can be difficult, forcing you to acquire it on nearly every accessory slot and perhaps even picking up some extra nodes on the tree, but the rewards are well worth it. In addition the shaped affix, look for 200+ Energy Shield. Resistances are icing on the cake, but not necessary as it is a difficult craft to begin with. This can be one of the more difficult and expensive pieces to obtain, but well worth it due to the amount of damage the additional mine adds to the build. If you are using Curtain Call, Dexterity is a requirement on nearly every accessory. Astramentis is a placeholder while using Curtain Call until you have the necessary stats to change to another piece. Aul's Uprising is a very powerful amulet, allowing us to run Grace at no cost, granting valuable Dexterity, Life, and Evasion. Presence of Chayula is the best option by far for anyone playing the Low-Life variant, offering a huge amount of bonus Energy Shield, critical immunity to stuns, and a nice Rarity bonus. Bisco's Collar is the best option for Magic Find. A shaped Rare amulet with quantity and rarity can also be used, ideally with critical multiplier, lightning damage, and Life. Opal Rings are the best Rare base for both Life-based and Low-Life builds. Resistance rings can also be very handy for capping resistances and freeing up some more space for damage explicits. Dream Fragments is an option for low-life builds and gives us permanent immunity to all three status ailments, as well as eliminating the need for a of Heat flask. The huge Cold Resistance boost, in addition to the Mana regeneration, are also nice to have. Lori's Lantern is another possibility for low-life builds, offering great movement speed and defense. The added Chaos resistance is quite valuable now that Incursions are back and here to stay, making this an even more attractive than before. 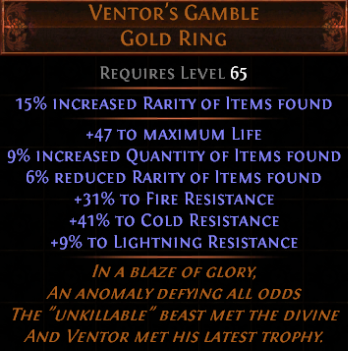 Ventor's Gamble is the best option for Magic Find. Cyclopean Coil is a great option that can be cheaply obtained, even early in the league. The attribute boost can be hugely helpful and function as a “budget Astramentis”, allowing you to activate Curtain Call that much easier. If you can actually get your Dexterity above your Intellect, you will also have permanent immunity to all three status ailments, which is a great bonus. Darkness Enthroned is a great option for low-life and offers a potent combination of damage and defense, depending on what Jewels you can afford. A Rare Stygian Vise can be an excellent option as well, especially for capping Resistances. A Crystal Belt with a high Energy Shield roll, Strength, and Resistances is a fine option as well, but is usually more expensive than a well rolled Stygian Vise and offers less overall benefit. Headhunter adds a lot of fun and speed to the build, and the Dexterity roll is a nice bonus. It is an exceptional belt for Beyond maps and delving, but otherwise just a crowning glory type of item that signifies your build is truly complete. While not the greatest for low-life, it is likely the best overall choice for Life-based builds as far as clear speed is concerned. It is not a necessary obtain right away, as we require a reasonably high level to take full advantage of it anyways. Once you can afford it, and you have to Passive Points to do so, it is a very efficient Jewel and well worth the acquisition. All things told, it is actually quite an economic pickup as well when contrasted with well rolled Rare Jewels. Fluid Motion can be very helpful in obtaining additional Dexterity, allowing you to take full advantage of Cyclopean Coil. All told, assuming a perfect implicit, this Jewel grants 84 Dexterity. While this gem is a massive boost to both damage and movement speed, it is an expensive investment, and not necessary to complete the build. The Grace mods are not strictly necessary, but the movement speed bonus is phenomenal for clear and bossing. 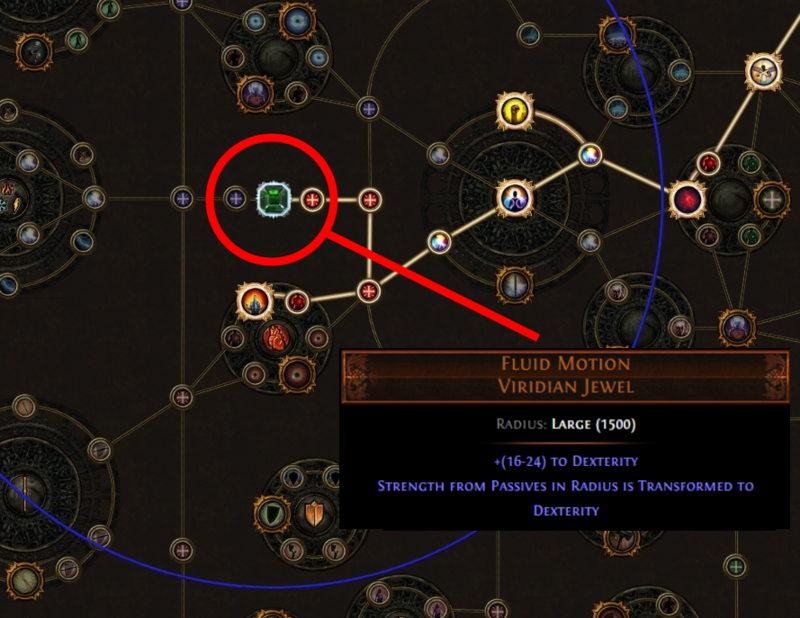 It can also be a relatively cheap mod to obtain on a Watcher’s Eye earlier in the league, as most people are looking for the flashier tooltip increasing damage mods. Swap out the Adrenaline suffix for of Heat if you do not have freeze immunity from Cyclopean Coil. Swap out the Jade Flask for Divination Distillate if you are Magic Finding. Flasks for low-life setups are a little more flexible, and you can feel free to change them up as you see fit. The Wise Oak, for example, can be a powerful choice for bossing if you are able to balance resistances, or at least have lightning as your highest. What’s Better, Life or Low-Life? This is the most commonly asked question, and the answer is not entirely objective. For most players, we recommend the Life-based version of the build, and it likely has higher potential at the extreme end game. It is also easier to gear early in the League. The low-life version, on the other hand, feels great to clear with and deals well with clearing. It is also a higher damage option in the “mid” game — once you get your core pieces and have Pain Attunement active, this iteration feels really good. It is also stun immune and a little tankier against big “rogue wave” type hits. Ultimately, this is a distinct choice in playstyle and preference. We prefer running with Lavianga's Spirit, as it has high amounts of charges and can be kept active at virtually all times while clearing. An Eternal Mana flask can be substituted out if you want an extra flask suffix. 31 Jan 2019 Updated and expanded the "Gems" section of the guide! 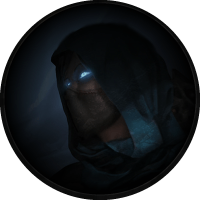 03 Jan 2019 Added an "About the Author" section, and made a few small Betrayal related edits! Tried this build and I don’t get how anyone would want to play this way.